"'Lord G-d' has also been exclaimed - minus the soiled trousers - by those seeing a Canon 1200mm/5.6L USM for the first time. At 36 lbs, 33" long and 9" wide at the front element, calling this lens a 'tele' is like calling King Kong a monkey," wrote Allan Weitz in his post, The Mother or all Telephotos. He shows some pictures captured with the monster lens, and then reminds us that using the 2X extender will get you a 2400mm/f11 rig... for those needing just a little more reach. 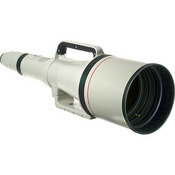 There is another monster lens by Canon, a 5200mm behemoth which you can see here- link.